How to Perform a Local SEO Audit For Your Website All by Yourself! 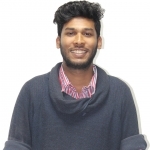 How to Perform a Local SEO Audit All by Yourself? If someone is trying to convince you that performing a local SEO audit all by yourself is an impossible feat, then let me tell you right away that (SPOILERS AHEAD) it’s not. Getting a local SEO audit done for your own business, your friend’s, or even a client’s is not one of those Herculean tasks that only people with a PhD in I Told You So can do. All it requires is, like everything else, patience, practice and a little bit of knowledge about the basics. In this article, we’ll be giving you step-by-step instructions to help you successfully conduct a local SEO audit all by yourself. But, we’ll cover some basics before that – so if you know this part of the story, feel free to jump directly ahead to step #1. What is local SEO, and why do I have to perform a local SEO audit for my business? Let’s start from the top. SEO, as most of you might already know, is short for Search Engine Optimization. Getting your website SEO-ed makes it easier for search engines to discover and index your website, content and your business. In other words, if you haven’t guessed already, SEO helps you get your business in front of the right kind of audience, and improves the traffic that you will receive from the organic channel. Local SEO, is a specialized part of SEO, which applies to local businesses in particular. The simplest example of local SEO is a “near me” search. Not aware of what it is? Allow us to explain. 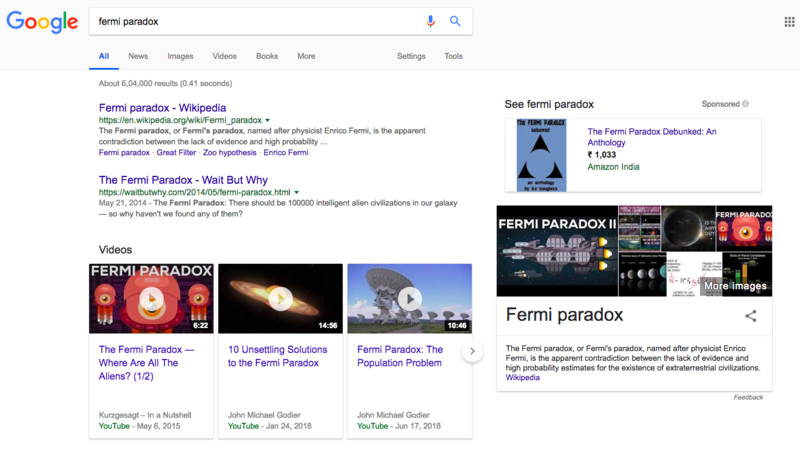 If you search for “fermi paradox”, you’re bound to get a result like the one in the image below. This is an example of a normal Google search. 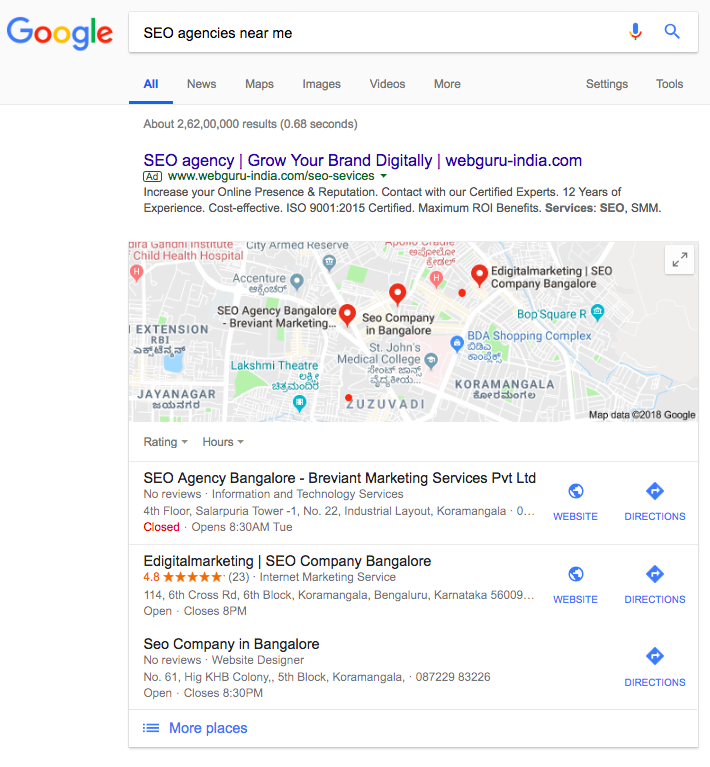 However, if I search for something with local intent, like “SEO agencies near me”, the results that appear are no more just blue links to websites. The search results that appear can be categorized as paid ads, followed by business listings, which are then followed by organic search results. 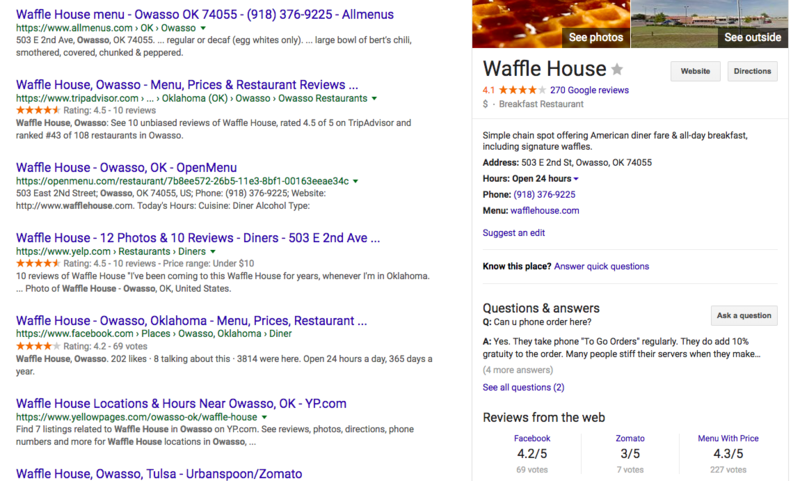 Google realizes that you are searching for a business near you, and shows you results accordingly. Even the organic results that you find here are “local organic results”, which means that these websites have optimized their SEO for showing up on local searches. This is what local SEO is all about. Conducting a local SEO audit for your business ensures that you show up on relevant local searches that users around you will make. So, without further ado, let’s get started with step #1 of our local SEO audit. Owing to how high up in the search engines business listings appear, getting your business listed online should be the first step in optimizing your business’ local SEO; and this is not restricted to getting your business listed on Google alone. Check out how the results for the popular search term “restaurants near me” looks like after the business listings. As you can see, right after the Google listings, there are links to TripAdvisor, Yelp and Opentable, which are all third party websites that provide data about local business. So, what does this mean for you? It means that you need to make sure you get your business listed on all the top directories out there to improve your local SEO. If you’re not sure about which are the business directories in your local niche, check out this list of business directories. If you think that it’s going to be very difficult for your to manually get your business listed on different websites, you can use an automated listings platform like Synup to get the job done. Regardless of which industry your business belongs to, you need to ensure that your business is listed on search engines and directories such as Yelp and TripAdvisor. More importantly, make sure that you get your business listed on Google My Business, which is the source of Google’s local business listings. If you’re not listed on GMB, then it means that you’ll never show up on Google Maps or on Google’s search results – and we’re sure that you don’t want this to be the case with your business. The first action item on your local SEO audit to-do list needs to always be: ‘Get listed online’. Let’s check out the search results for yet another popular way of searching for local businesses: “*local business type* in *city/state name*”. Let’s take “carpet cleaners in florida”, for instance. As always, we have the business listings, but right after that, we have two websites that are showing up instead of the usual Yelp and TripAdvisor. How’s that? Enter, on-page local SEO. Taking a closer look at these guys, you can see that their websites’ homepages’ title tags contain “FL” or “Florida” in them. By doing this, they’ve made Google realize that this business is in Florida. And it doesn’t stop there. Other things that you can do include adding the city/state name in the meta description and other parts of the website, such as the header, footer, etc. If you want your business’ website to show up on local organic searches, then you need to make sure that you do this as well. You can learn from the examples cited above, and structure your website’s title tag the same way they have for maximum impact. Once you’re done with your listings and on-page local SEO, you need to work on your website’s content. Experts believe that the frequency of occurrence of keywords in your website plays a major role in determining your local rankings. This means that if you’re running an auto detailing service that operates in, say, the San Francisco Bay Area, then writing about your topic of expertise on your blog and posting about events that you held in your area can help your local SEO. You can carry this out with ease if you’re using a CMS like WordPress, since it allows you to optimize your webpage’s URL, title, meta description, category, etc. with ease. You can even use these WordPress SEO plugins when you’re writing content to ensure that you’re heading in the right direction for best results. If you are running a B2C business that operates locally, then getting your business listed on social media sites is an absolute must-do for your local SEO. Social signals and how big an SEO factor they are is a much debated topic in the realm of local SEO, but social media sites provide a lot of other benefits even otherwise. Not only do they provide you with a platform that allows you to engage with your local target audience, it also shows up on your Google My Business listing when someone discovers your business online. 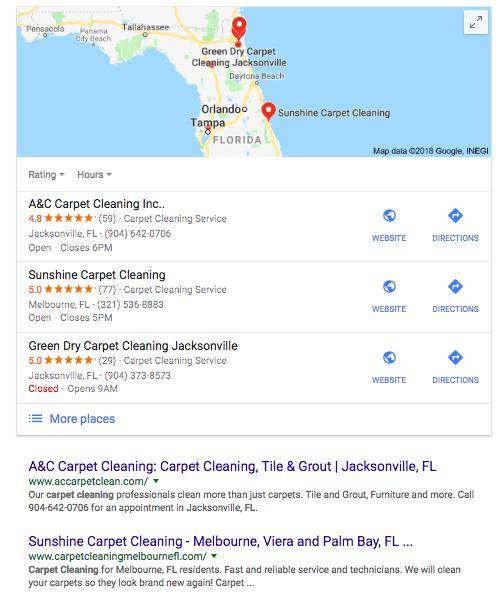 In the bottom right corner, you can see that the Google My Business is connected to the likes of Facebook, and other local directories, along with a key piece of information – your overall star rating on that site. Social media sites and business listings provide a platform for customers to leave behind reviews about your business, and depending on the kind of reviews you receive, your business can pique a customer’s interest or make them avoid your business altogether. Make sure that you engage regularly with your potential customers on social media, and respond to reviews that you receive on your business listings. Establishing a rapport with your happy customers can help make them return to your business, and responding to unhappy customers can help you change their mind about their first impression. You can even use a review generation wizard to automate this process for you. These are 4 things that you absolutely need to do to make sure that your local SEO audit is done. Stats suggest that users making local searches are on the increase, so make sure that you have an optimized local SEO presence to improve your business’ local online marketing efforts.